Jerusalem-blue skies graced the filmed run of more than 20,000 racers from 52 countries in the Jerusalem Winner Int'l Marathon Friday. 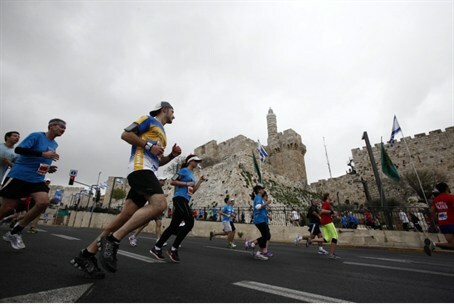 Beneath partly cloudy skies and cool temperatures, over 20,000 people from 52 nations competed in the 2013 Jerusalem Winner International Marathon this past Friday. The race, won by Abraham Kabeto Ketla of Ethiopia with a time of 2:16:29.25, set a new record for the Jerusalem Winner International Marathon -- shown in the video below. In second and third place were Luka Kipkemoi Chelimo of Kenya who finished in 2:19:01.95 and Vincent Kiplagat Kiptoo of Kenya who crossed the finish line with a time of 2:20:12.60. Susan Silkes, an immigrant from the United States who is a special education teacher in Jerusalem, participated as part of the HASC (Hebrew Academy for Special Children) group. "What made the marathon a beautiful experience was that in addition to the joy of running for Jerusalem, people took the marathon and turned sponsoring their run into a way of making others aware of different organizations and special needs,” she said. “One person, Miriam Tekuziner of Ramot, put together a group to raise money for a friend with cancer. There were also people running for someone who has a rare skin disease and needs treatment -- and while I was running, it was incredible to talk to these people," Silkes declared.